Tweee! Christmas is almost here! Santa is probably taking a last minute nap and the elves, no matter how jolly they are under normal circumstances, are nearing the end of their ropes and talking union like they do every December 23rd. Holy Yule Tide Cheer, an elf can only tolerate so much before they all start feeling a little Norma Rae. While we weren’t concerning ourselves with Elvish labor relations, we were chuckling over these five things. that name for a bad guy in her book, Ava and Kelli would never let her keep it. Why? Much too absurd. 2. Sparkly Christmas clothes. Tis the season for sequins. Except for Christmas and New Years Eve there are very few opportunities to wear glittery clothes. It’s a shame really, but still a gal has to have standards. Any other time of the year, with very few exceptions, the Sisters will make fun of sequined women. Hop on over to your favorite hoochie store and grab yourself some bugle beads. Oh what the hell, grab some gold lame while you’re at it. Throw caution to the wind. 3. Silly Christmas Carols. 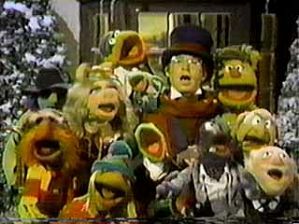 Under normal circumstances, Andrea Bocelli and the Muppets probably wouldn’t be paired together for anything. And how funny is the Bob Rivers song The 12 Pains of Christmas? “Rigging up these lights, indeed!” And anything by Straight No Chaser. You know what we never need to hear ever again though? Grandma Got Run Over By a Reindeer. We are prepared to run over her ourselves and then use Ava’s new pink gun to shoot the friggin reindeer. We understand reindeer meat makes excellent chili. 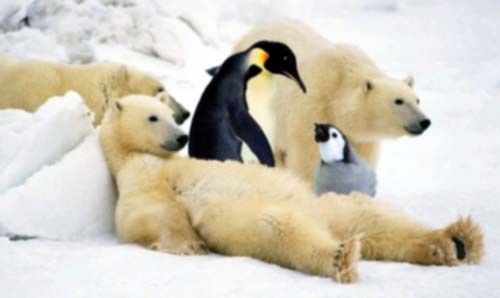 with a polar bear and a penguin on it. Apparently, it upsets him greatly that people are so stupid as to put two animals together that would never, ever, not even during the apocalypse, meet each other in real life. It would seem that he has put a great deal of thought into this and it amused Amylynn to no end. There are several things she did not point out to her irate friend. The first being that he needs to get over it because if there is one thing the Sisters are 100% sure of is that people are remarkably stupid. And number two, THEY’RE TALKING PENGUINS! Is it alright if Santa meets the penguins? After all he lives on the North Pole with the polar bears and we don’t want anything happening with the space/time continuum. 5. Cookies. 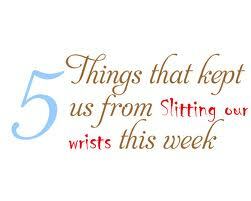 How could we slit out wrists when there are still Christmas cookies to eat? Beautiful, sprinkled, frosted bits of pastry goodness. Well, except for oatmeal raisin. We’re not willing to eat oatmeal raisin cookies no matter how you disguise them. It’s the raisins – just can’t do it. It’s a weird word for a weird little “food” item. Sure if you want to eat something that looks like a tick, go right ahead. You can have ours. We, however, will be eating the sugar ones, the cut out snowmen and the gooey chocolate chip ones. We’ve got a whole plate of the twisty, powdered sugar thingys with the fudgey dollop and a cup of coffee. Life is good.